Our skeletons are held up by the soft tissue in our bodies, in tension, so as the bones do not actually touch one another. This enables a wide range of free movement between the joints in the body. This sculpture that I came across whilst attending an Open Day at Canterbury University recently shows this concept really well. 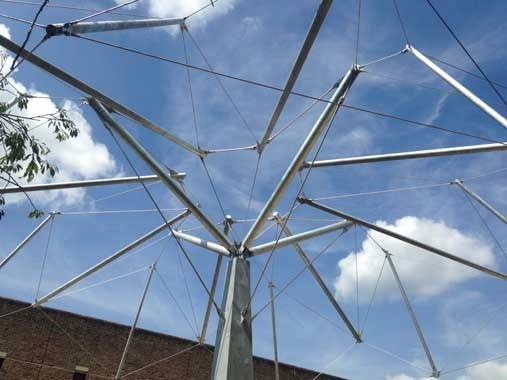 The poles in the sculpture do not touch (like the bones).They are held taught by the wires (like the soft tissue, ie fascia, tendons, ligaments, muscles). If someone was to tug on one part of the sculpture, the resulting movement of the poles would create an effect further along the sculpture. This is also what happens within the body. Tight soft tissue at one end will have repercussions further along a line throughout the body, resulting in the bones being pulled out of alignment slightly which in turn can cause pain and restricted movement. Regular deep tissue massage can prevent this from becoming a problem and enabling you to use your body to its optimum ability.